Some baseball superstitions are accepted as cold, hard truth. But in the world of physics, the most accepted verities are subject to experimentation. A corked bat hits the ball further? Not in Lloyd Smith's lab. Baseballs today are livelier than in the past? See above. Storing balls in a humidor can curb home run production? We'll grant you that one, but only because Smith has fired the balls through a cannon and measured their bounciness as they hit a bat. Smith, an associate professor of in Washington State University's School of Mechanical and Materials Engineering, tested all three premises his Sports Science Laboratory on Pullman campus. "I've got the cool machine that can do the tests," says Smith. Working with colleagues from the University of Illinois and Kettering University, his findings are in this month's American Journal of Physics article, "Corked Bats, Juiced Balls, and Humidors: The Physics of Cheating in Baseball." The juiced-bat question arose in earnest in 2003 when Chicago Cubs slugger Sammy Sosa was caught using a bat that was illegally drilled out and stuffed with cork. The researchers first took a 34-inch wooden bat and repeatedly measured the speed at which a ball bounced off it when fired from a cannon at the combined speed of a thrown ball and swung bat. They then hollowed out the barrel of the bat, stuffed it with bits of cork and fired the ball at it again. If anything, they found, a ball came off a corked bat more slowly than a regular bat. The sounds of cannon fire can be heard at the edge of Washington State University. 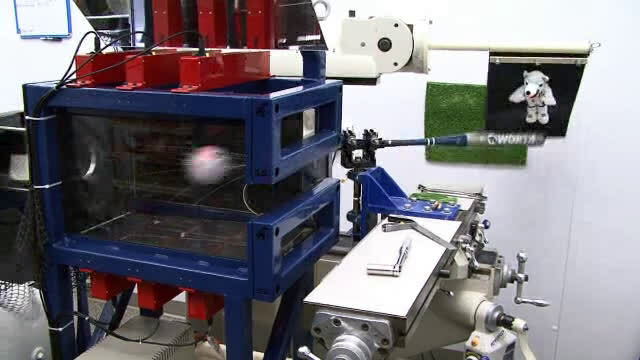 But there isn’t a battle underway, just testing of bats and ball at the Sports Science Laboratory. Under the guidance of Professor Lloyd Smith, the lab specializes in the dynamics of bat and ball collisions. The lab work has helped regulating agencies understand equipment performance through trial and error. However, the authors acknowledge that batters might cork bats to make them lighter, improving their ability to "get around" on the ball faster and make more solid contact. But fully addressing that issue would require player interviews, acknowledges Smith. "They're not going to want to talk to us about this," he says. The issue of juiced balls emerged in 2000, when the first two months of the major league baseball season saw substantially more home runs than the same time the previous year. In 2004, the researchers compared contemporary balls with a batch of late-'70s balls provided by the family of former Oakland A's owner Charlie Finley. They fired them at both a steel plate and a bat at speeds of 60, 90 and 120 mph. They found the balls' coefficients of restitutiontheir ability to bouncewere nearly identical. In retrospect, Smith speculates that it may have been the players, not the balls, that were juiced. "If this problem were to happen today," he says, "people would be looking at how effective we are in doing our drug testing. But at that time it really wasn't on the radar screen so they were looking at other avenues." The physicists did find that a ball was less lively if kept under the controlled temperature and humidity of a humidor, as practiced by the Colorado Rockies starting in 2002. The Rockies, trying to compensate for the extra distance balls were flying in the high, dry and thin air of Denver, noticed a drop in offensive statistics like home runs and total runs per game. The researchers took four dozen baseballs and stored them in environments with humidity ranging from 11 to 97 percent and temperatures as low as 35 F. Measuring their coefficient of restitution against bats, they found the colder, moister balls bounced less. The researchers calculate that a humidity increase from 30 to 50 percent would take 14 feet off a 380 foot fly ballenough to decrease the chances of a home run by 25 percent. Compared to the actual performance of humidor-treated balls at Coors Field, "our calculation is right on the money," says Alan Nathan, study co-author and a professor emeritus of physics at the University of Illinois. However, the authors acknowledge that batters might cork bats to make them lighter, improving their ability to "get around" on the ball faster and make more solid contact. There is no might about it, that is the reason bats are corked. The funny thing about steriods is, you can take them for a month, get a strength gain, then stop taking them and keep the strength. That is why many athletes use them, its not harmful to your body if done in moderation! That is also true of cocaine, heroin, and many other drugs of abuse. That's why these drugs originated in doctor's kits in the first place, was the benefits received by moderate and TEMPORARY use. The temporary part often falls by the wayside however, followed soon after by the moderation part.